The 12 oz. 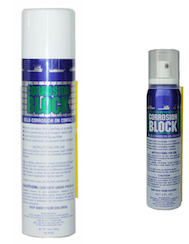 (354ml) aerosol spray tin contains a foam version of Corrosion Block® which is handy for coating larger areas such as Battery Posts and hold down hardware on larger RV Batteries. It is supplied with a small spray tube for smaller areas. The 4 oz. (118ml) pump spray container holds a liquid form of Corrosion Block® that can be pumped out for a drop or two on a connector or continuously pumped to provide a liquid spray of an area. Click the INFO icon to be taken to our RV Seminar Notes - Some handy things to know and do around your RV. Click the INFO icon to be taken to our RV Seminar Notes – Some handy things to know and do around your RV. Kwik Lube"Grease Gun in a Can"
This lubricant is recommended by Kwikee the maker of the most popular RV step. It is an aircraft lubricant that goes on as a reddish liquid to penetrate and lubricate and leaves a heavy grease layer to provide protection against water and dirt infiltration. This Product can only be shipped within Canada.